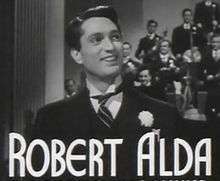 Robert Alda (February 26, 1914 – May 3, 1986) was an American theatrical and film actor and father of actors Alan and Antony Alda. A talented singer and dancer, Alda was featured in a number of Broadway productions before moving to Italy during the early 1960s. He appeared in many European films over the next two decades, occasionally returning to the U.S. for film appearances such as The Girl Who Knew Too Much (1969). Alda, an American of Italian descent, was born Alphonso Giuseppe Giovanni Roberto D'Abruzzo in New York, New York, the son of Frances (née Tumillo) and Antonio D'Abruzzo, a barber born in Sant'Agata de' Goti, Benevento, Campania, Italy. He graduated from Stuyvesant High School in New York in 1930. He began as a singer and dancer in vaudeville after winning a talent contest, and moved on to burlesque. ↑ Strait, Raymond (1983). Alan Alda: A Biography. New York: St. Martin's Press. pp. 7–9. ISBN 0-312-01703-0. ↑ Alda, Alan. "Alan Alda TV Legends Interview, Part I (13:25-14:30)". Archive of American Television. Academy of Television Arts and Sciences Foundation. Retrieved 17 February 2014.